1/2in Stamp Straight Tape allows precise accuracy when stamping letters on metal jewelry. Click for more info. 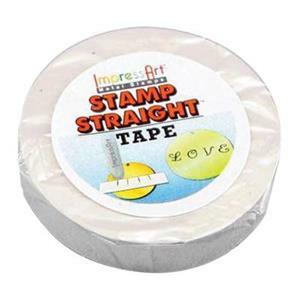 Impress Arts Stamp Straight Tape allows precise accuracy when stamping on metal. Stick the tape onto your piece where you would like to stamp then slide the bottom of the design down until it touches the top of the tape and strike with the hammer. Use the tape as your guide! Weight: 23.18 Grams per Piece Notes: Use stamp straight tape to form a level line on your stamping metal. Then gently place the stamp above the tape on the metal and slide it down until you feel the bottom of the impression catch on the edge of the tape. Strike with your hammer and pick up your next stamp.